At this point in the staircase renovation, it was time to install the spindles on the angled portion of the staircase. This can be a bit more challenging to determine how to lay out the spindles. They need to be cut the right length because if they're too long or too short the spindles will be out of plumb (it won’t be straight up and down). In order to determine the exact length of the spindle and make sure it’s plumb at the same time, I made a jig. The stair spindle jig is made of two pieces of hardboard that are cut to the same width as the spindles. Each end is cut to the angle needed for the stairs. I then cut a slot in the middle of both using the table saw. The slot is the same width as the bolts used to hold the two pieces together. This way I can slide the jig longer and shorter. I also added measurements to help centre the spindle and determine where to cut off each end. This jig allowed me to slide the piece longer and shorter and allow me to insert it into the grove of the shoerail and handrail. I put a level on the side and then extended it to fit in the space before securing the nuts on the bolts. I now would have the perfect length for each spindle. 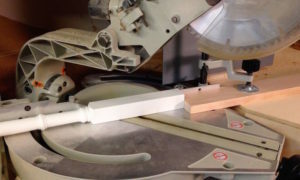 When working on a project such as cutting spindles, where you have many pieces to cut at once, the fastest and most accurate way to do that is to use a stop block on your saw. It gives a consistent and accurate cut every time so all the parts match. 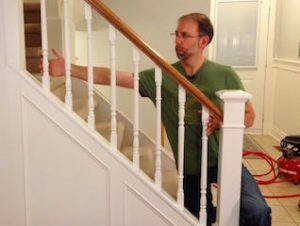 At this point, installing the spindles follows the same process as installing spindles for a horizontal railing. Cut a piece of the fillet strip and place in the shoerail at the bottom of the stairs beside the newel post. Then you can add a spindle. Ensure the spindle is plumb, and measure the top fillet strip. You now have the starter fillet strips ready. Cut the remaining fillet strips to the length that will space the spindles the same as the horizontal railing sections. Test fit the spindles without glue to ensure the spindles are centered between the newel posts properly. If they're not centered, measure the distance at either end between the last spindle and the newel post, add them together and divide by 2. Cut the end fillet strips and reassemble everything with glue. If the spindles are loose in the shoerail or handrail, also add brad nails for additional hold. I hope this takes the mystery out of how to install stair spindles in staircases with closed stingers. I had to hire a professional to help me understand this so I'm sharing this information to help others do this in their home improvement projects. If you have any questions or feedback, please leave a comment on the video and we will be happy to reply.